Since its release earlier this year, the SVOne smartphone-based autorefractor from Smart Vision Labs has won praise from eye care professionals. The SVOne uses wavefront aberrometry, a technology that measures refractive errors more comprehensively than common autorefractors. Among the professionals using the device are Michael I. Davis, O.D. in Maryland, Jordan Kassalow, O.D. M.P.H. in New York City and Tony Prasnikar, O.D. in Illinois. Davis provides full-service care in his Eldersburg, Md. practice, Opti-Care, and he also tends to prisoners with developmental disabilities. "With my recent purchase of the SVOne I've put aside my retinoscope and now use this innovative new technology," said Davis. "Due to its portability, I believe this could potentially be a very powerful tool for optometrists who conduct mobile exams in settings such as prisons and nursing homes." Kassalow's practice is located in Manhattan and has developed an international reputation for excellence. He also founded VisionSpring, an enterprise that works to ensure affordable access to eyeglasses in the poorest reaches of the world. "Technology that provides an objective refraction of the eye is needed in both resource-constrained and resource-rich environments," said Kassalow. "In resource-constrained environments, it's difficult or impossible to find people with top notch retinoscopy skills, and existing autorefractors are too expensive or difficult to transport. In U.S.-based settings, this technology can improve patient flow or facilitate exams in settings where the doctor must come to the patient." Prasnikar's practice, Eyecare Center Of DuPage, Ltd., in Westmont, Il. is a community-based, private optometry practice. "Having had experience with a previously unreliable handheld autorefractor, I was relieved to find something that would provide consistent, repeatable objective data that I could use to streamline the refraction process," said Prasnikar. "The SVOne is one of the best autorefractors on the market today due to its technology, size and price," said CEO and co-founder Yaopeng Zhou. "It gives eye professionals freedom to optimize their workflow both inside and outside their practice. It is changing how optometry is being practiced." Smart Vision Labs is building the future of vision care by making optometric technology accessible to people around the world. The company was founded in 2013 by photonics researchers Yaopeng Zhou and Marc Albanese, who met more than 10 years ago while developing a scanning laser ophthalmoscope in a joint program between the Schepens Eye Research Institute and Boston University. 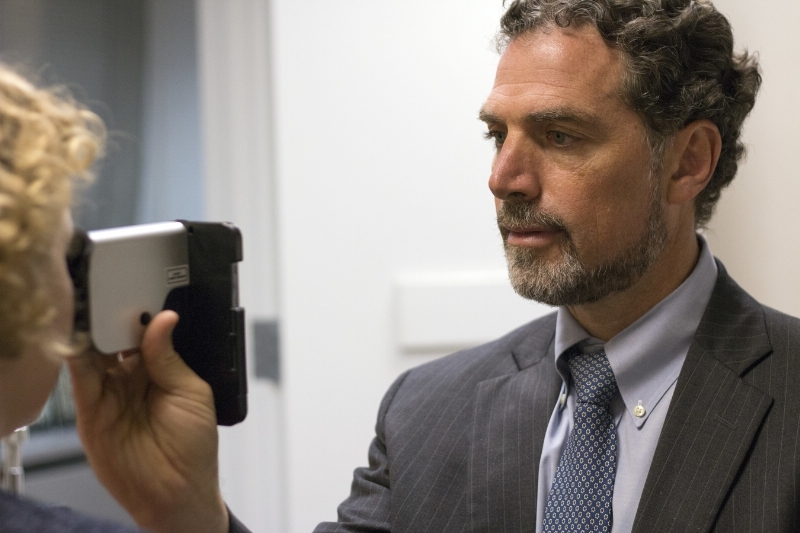 Recognizing the need for revolutionary and efficient technologies to enable regular eye exams, Smart Vision Labs launched its flagship product: the SVOne smartphone-based autorefractor powered by wavefront aberrometry. Today, eye care professionals are using the SVOne across the United States and in 21 different countries. Zhou, Albanese, and the rest of the Smart Vision Labs team are working to make their technology accessible globally. 0 comments on "Revolutionary New Smartphone-Based Autorefractor Expedites Optometry Practice Flow and Expands Community Reach"